The two Marmotte rides will have to be about a week apart and I would like to get used to the altitude before I take on either. Depending on our time of arrival, I’m planning on a prologue of my Tour de France 2017 that will either take me up and down the Lautaret, or to Bardonecchia and back, over the Echelle. Going up the Lautaret, Paula will have to block the road further up to the Galibier, because I may well forget my good intentions and push myself into taking on that steep final too. The Lautaret itself (2,057 m, 27.7 kilometers, 3.1%) is almost false flat – for pros anyway – up to le Casset, but even during the final 7 to 8 kilometers, the grades rarely exceed 7%. The only thing that might make that difficult, is a (strong) head wind, because that part is open and – like the whole climb – pretty straight (no hairpins). The Echelle (1,768 m / 20 km / 2.2%) is even more false flat, up to the final 4 kilometers, which average some 6%, with a maximum of 9%. As I will definitely do the Lautaret with the final up the Galibier anyway, I think the Echelle might be the best choice for today. This is going to be a bit more challenging, going up the Izoard. I will probably be able to resist the urge to extend that to a return trip to Guillestre, as I’m planning on tackling the Izoard from the other end in another stage later on anyway. The Izoard will be the first col well over 2,000 meters, with its summit at 2,360 meters. 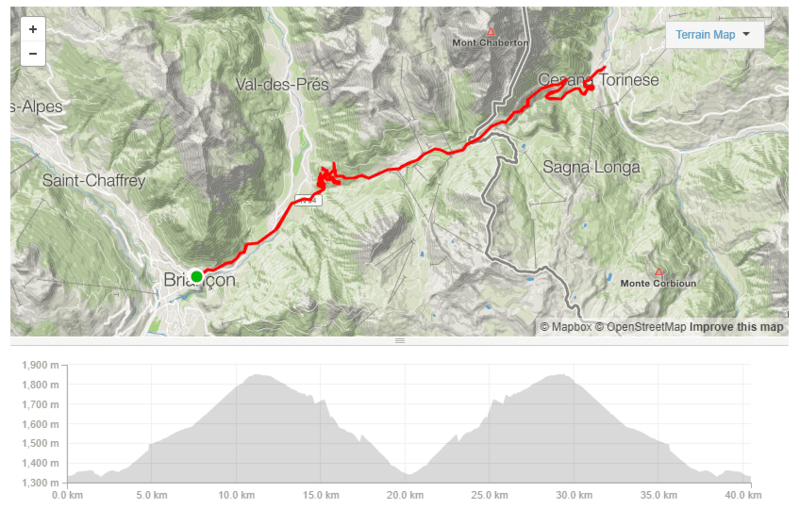 From Briançon, the climb is 19.1 kilometers long, at an average grade of 6%. While that may seem moderate, it is very much like the other end: tougher than it looks. The first 4 kilometers or so, the average is around 5.8% after which there’s a short flat / downhill of about 1.5 kilometers. The next 6 kilometers are a little irregular, with alternating slopes between 2% and 7.5%, averaging 4.5%. Note to self: the road to Les Fonds de Cervières – a left turn onto the D89T at Cervières – might be worth exploring too. For this stage, I’m thinking of tackling the other end of the Izoard, going from Briançon to Guillestre via the western approach, instead of over the Izoard. This would be the ‘Medio Fondo’ of the Granfondo Serre Chevalier. I’ve climbed the Izoard in 2014, starting in Châteaux Queyras. From Guillestre up to the split close to that village (D947/D902), you have covered 20 kilometers with a modest elevation difference of less than 400 meters. While this bit of false flat may not seem like much of a challenge, it’s 20 kilometers long and then the real climb still has to come. From the split, the remainder is just over 14 kilometers with over 1,000 meters of elevation gain. That’s over 7% average as it is, but the hard part only starts after you leave the valley, near Brunisard. Plan B for today: as the GF Sestriere is on the menu for tomorrow, the wiser option for today may be the ‘Corto Fondo’. It offers a nice – and shorter – alternative, but it would include another ascend of the Echelle from Bardonecchia – not a bad thing, but still. Or, the Lautaret and Galibier could offer a good alternative. Time for the first Marmotte! The Gran Fondo Sestriere – a one time Marmotte event, dubbed ‘Marmotta’ on that occasion – was cancelled for this year. The reason for that remains a bit foggy, but they say it will be back in 2018. It (obviously) starts and finishes in Sestriere, but coming from from Briançon, it makes more sense to start in Cesana Torinese – from Sestriere to there is a 10 kilometer descend anyway. 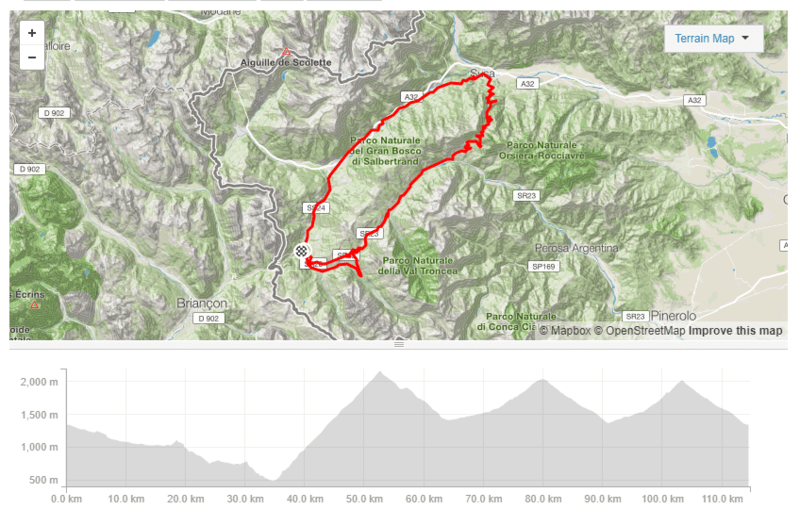 The big climb in this Gran Fondo, is the Colle delle Finestre (2,176 m). With 18 kilometers in length and an average of over 9%, including 7 kilometers of gravel road, this will be a very ‘interesting’ climb. Compared to the ascend of the Finestre, the climbs up to Sestriere (2,035 m) both seem like peanuts. First ascend is from Usseaux: 19 kilometers, but at an average of 3.6% that almost looks like a recovery, which probably won’t feel like that anymore after the first 5 or so. Besides, half of it is between 5% and 7%. After that, the descend to Cesana Torinese, were the alternative road through Sauze di Cesana leads up to Sestriere again. This climb is 11.5 kilometers long, at an average of 5.9% – it offers a few steep(er) stretches, but most of it is around the average. Depending on how I feel and whether or not I had a rest day after stage 2 or 3, this will take me up the col de Vars (2,109 m). I will get on my bike after a car transfer to somewhere near Guillestre, warm up for about 5 kilometers and then tackle the 19.2 kilometer long ascend. I’ve done this col from the other end in 2014, which turned out to be a nasty ‘surprise’, at least the final 8 kilometers. From Guillestre, the average is similar (5.8% compared to 5.6% from Jausiers) but there is a 4 kilometer stretch in the middle that is near flat. The first 7 kilometers are the hardest at 8.1% and the final 7 kilometers average around 6.2%, the first 3 of those being the toughest at 7.5%. If I’m up to it, I may go up to Risoul (1,855) after descending back towards Guillestre. But as that is another 13 kilometer long climb at 6.8%, with various 8% stretches, I might just save that for another day. Note to self: Risoul could also easily be combined with the climb up the Izoard from Briançon, then descend to Guillestre and up to Risoul. Paula would not be able to follow me with the team car, so I’d be out on my own. Not necessarily a bad thing, but if something happens up there, it may be a while before they find you. Still, getting up to 3,000 meters… Damn. Anyway, today might be a good day for the Col de Granon (2,413 m). However, only the first kilometer and one three kilometers further on are below that – everything else is actually (well) over 9%, with one kilometer at 11.5% and another at 10%. It’s highly unlikely that I will have the energy left to also get up the Croix de Toulouse after that. I penciled it in for this stage, but it may actually be better to do that some other day. This ‘Route du Poët Ollagnier’ is also referred to as ‘the 21 hairpins of Briançon’, a reference to the Alpe d’Huez. Its summit is at 1,962 meters and it is only 6.3 kilometers long – at 10%. Today I will take it easy by going up to Montgenèvre, down to Cesana Torinese (or Oulx) and then back up again. 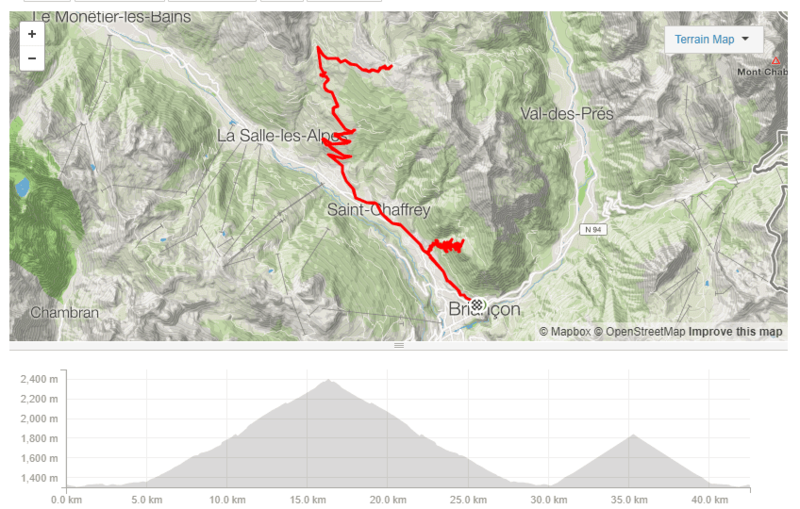 This col has its summit at 1,854 meters – from Briançon, it’s some 11 kilometers long, at a modest average of 4.8%. As to la Vachette, 3 kilometers in, it’s mainly flat, the average from there is a little more challenging, at 6.3%. It’s fairly even climb, with most of it between 6% and 7%. From the other end, i.e. from Cesana Torinese, it’s about 8.2 kilometers long, at 5.5%. This climb offers a few steeper stretches at 9 and 10%. Time to ride the other Marmotte I have planned! I have the choice to ride the original Marmotte Alpes or my own version. The former will give me the chance to see if I could actually do that in ‘gold certificate’ time, but it would be best to have a one-night relocation to Bourg-d’Oisans if I do. The transfer from Briançon to Bourg is at least 1.5 hours, but from experience I know it will most likely take longer than that. As an alternative to not starting in Bourg-d’Oisans and not finishing there – at the summit of Alpe d’Huez – I could start on the summit of the Lautaret, which would only be a 30 – 40 minutes transfer by car. I then have the choice to ride ‘clockwise’ or ‘counterclockwise’. Clockwise means going down to Bourg-d’Oisans, get up the Alpe d’Huez, go down to Allemont via Villard-Reculas and from there, follow the original route. Instead of going up the Alpe d’Huez, I could opt to take the Col du Sarenne instead. Counterclockwise, I would first get up the remainder of the Galibier, which is a lot harder to start with than a descend. But there will be a lot of downhill after that too, only interrupted by a few kilometers of ascend between Valloire and the summit of the Télégraphe. I would then get up the Croix de Fer from Saint-Jean-de-Maurienne, a climb that I remember well from my struggle in 2012. As a consolation, I can ride up to Alpe d’Huez via Villard-Reculas instead of the classic route. I’ve done that in 2012 too and it is actually not that much easier. If I decide to ride the classic route, that will add some 8 kilometers and 220 meters of elevation to the trip. All four alternatives are between 175 and 185 kilometers in length, with the elevation difference between 5,500 and 6,000 meters – while elevation is ‘Strava calculated’ and most likely not 100% accurate, it’s certain that any of them are every bit as challenging as the ‘classic’ Marmotte. This stage will also require a car transfer first: either to Modane for the full length of Iseran, or to Susa for Mont Cenis and the Iseran from Lanslebourg. Either transfer is about 1 hour, but I’m leaning towards option two. The Col de l’Iseran from Modane is a staggering 56 kilometer long, but the more interesting bit starts at Lanslebourg, at the foot of the Mont Cenis. And even from there, the 33 kilometer ascend has a 12 kilometer flat(-ish) section through the valley after the initial climb up la Madeleine. Col du Mont Cenis (2,086 m) from Susa is a 30.3 kilometer long climb, but the final 7 of those are flat while your ride along the lake. Actually, before you reach the official summit sign, you will have been on a slightly higher altitude already. The remaining 23 kilometers are at an average of 6.8%, so not that easy – considering the inevitable flatter bits, amounting to some 4 kilometers, the average is over 7% and most of it is 8%. The Iseran from Lanslebourg is (still) 32 kilometers long. After the short climb up la Madeleine (6 km / 6%, with 1 km at 9.5%), the part to Bonneval features some ups-and-downs, but you will be at the same altitude by the time you get there. From Bonneval, the ‘interesting’ bit of the Iseran starts: 13 kilometers at 7.5%, with two easy bits to re-catch your breath a bit, but otherwise offering 8% and over (max 9.5% over two 1 km stretches). Other than the previously mentioned ‘may better save that for another day’ climbs, there are several options I’d seriously like to realize. This climb is 39.5 kilometers from Locana, but the first 12 – 13 are not that challenging. At Noasca and on to Ceresole Reale, over a not very well maintained secondary road, which is still better than the 3.5 kilometer long tunnel, the average is 6%, but there are several kilometers between 8% and 10%, before the grades fall back to 5%. A 5 kilometer intermezzo to catch your breath leads up to the final 13 kilometers. Thanks to a kilometer downhill, the average over that distance is only 7.3%, but without that it’s 8% and 5 of those are 9%. From Briançon it’s about an hour by car – over the Lautaret – to the start of the climb up to Les Deux Alpes (1,652 m). This short climb is some 11 kilometers long, at an average of 6.7%, not counting the final two flat ones through the village. 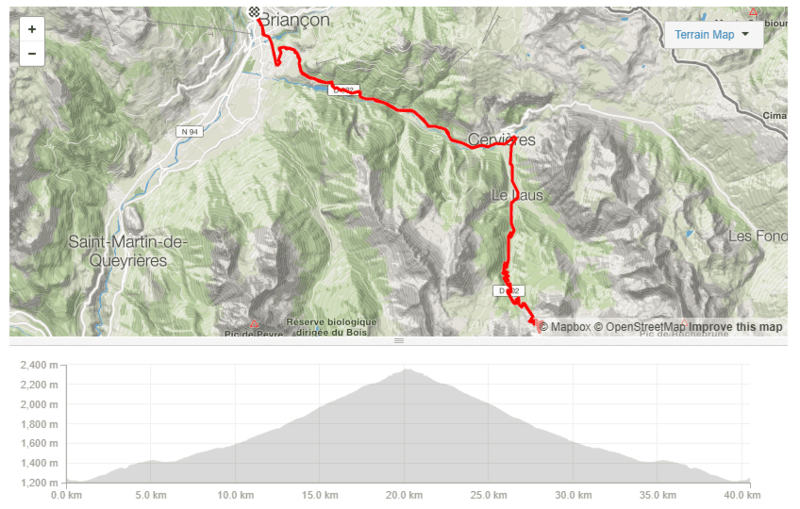 Further down that same route (towards Bourg-d’Oisans), at le Clapier you can get up to la Bérarde (1,713 m). This climb is a lot longer, at 27 kilometers, but much of it – especially the final 8 kilometers – is false flat. Only two stretches – 3 and 5 kilometers long respectively – between Vénosc and La Ville are steep. Another col I climbed – from the north – in 2014 is the Agnel – I would like to do that from the other end (Casteldelfino or a bit further down), but this would also mean a transfer by car, unless I want to do the ‘double’, i.e. both ends in one ride. Tour de France 2017 main page. let me know when you are there, maybe I come and ride le boucle d’Izoard with you!